The Lions hadn’t won a game on the road in a very long time. Very long. Sunday it looked as if they would be snakebitten again, as the Packers lined up for a potential game-winning field goal with seconds left, but Mason Crosby missed a 52-yard field goal to give the Lions a rather stunning 18-16 win for their second win of 2015. It wasn’t easy, as Calvin Johnson mishandled an onside kick with 31 seconds left, allowing the Packers another shot after they failed on the two-point conversion earlier that could have tied the game. Matthew Stafford threw for 242 yards for the Lions, who have had a tough season after firing their team president and GM. 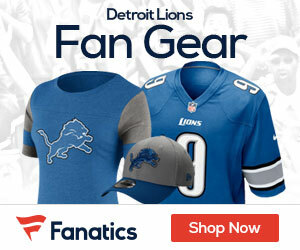 ”We don’t really care who gives us a chance, because we feel good about ourselves in that locker room and we know what we’re about,” Stafford said. Packers QB Aaron Rodgers was 35 of 61 for 333 yards, but the Lions seemed to have him rattled. 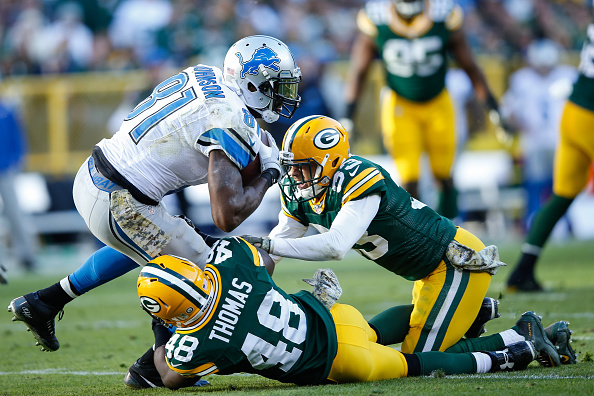 Receivers including Randall Cobb and DaVante Adams had a few drops, and the Lions defensive backfield played its best game of 2015. Green Bay finally got into the end zone when Rodgers found tight end Richard Rodgers for a 4-yard touchdown pass with 5:55 left. Lance Moore’s 4-yard touchdown reception increased Detroit’s lead to 18-10, and the Lions held on for a huge win in a place they barley ever win. It’s hopefully a win that will mean more down the road, now at 2-7 the Lions will host the Oakland Raiders next Sunday.